Stuffed with buttery beans, these eggs are just as creamy and satisfying as the standard version but with much less saturated fat. Place the eggs in a saucepan and cover with cold water. Bring to a boil over high heat. Reduce the heat to low and simmer slowly for 12 minutes. Cool under cold running water. Shell by tapping the eggs against the side of the pan and gently removing the shells. Cut the eggs lengthwise in half. Place 4 whole yolks in the bowl of a mini food processor and discard the remaining 2 yolks. Add the butter beans or kidney beans, mayonnaise, mustard, and pepper. Blend the mixture until smooth. Add the celery, carrots, and chives or scallions. Process using pulses, just until the vegetables are incorporated. Spoon the filling into the hollows of the whites, mounding to fill. 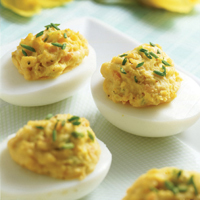 Place the egg halves on a platter, cover with plastic, and refrigerate at least 1 hour. Serve cold. Serving Suggestion: Can be made up to 1 day in advance.